I have been sailing the Bay of Fundy for quite a few years, and it seems that we were always in a hurry to get through the Reversing Falls at slack tide and then ride the ebb tide down to Dipper Harbour. 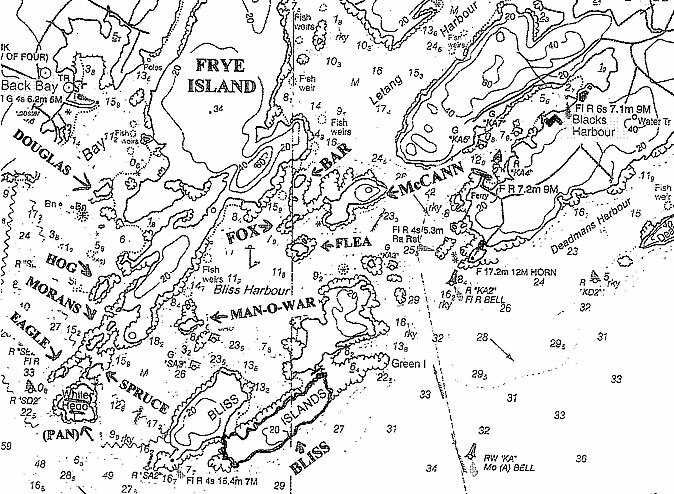 We would spend the night there and then grab the ebb tide down to either Grand Manan, Campobello or Cutler, Maine. We always bypassed the uninhabited islands along the way. Well, back about 7 or 8 years ago, I was out single handing our sailboat, leaving St.Andrews to head back to Saint John, once I got clear of Letete Passage, the weather had picked up a little so I checked my charts and noticed that Bliss Island had a well-protected harbor. So I headed for Bliss Harbour, when I got there I had to navigate around a few salmon cages but still found lots of room to anchor in this quiet cove. Once I got anchored I rewarded myself with a nice cool beverage, read my book, watched the seals and eagles and enjoyed the peace and quiet. When I woke in the morning I wasn’t in a hurry to leave this beautiful little island so I just sat there with my coffee and took in the scenery. This past summer I got to know the islands in the Bay of Fundy a little better. The first time was in August, when Tony Hooper and Nabil Salib of Connors Bros. gave Joan Mitchell and me a tour of the islands around Bliss Harbour, Blacks Harbour and Back Bay, in the Connors Bros. skiff. 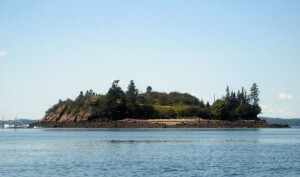 We got to see Bliss Island, McCann Island (Hills Island), Bar Island, Howards Island, Man of War island, Flea island, Spruce Island, Whitehead island and the big island Frye island where the McLean’s (previous owners of Connors Bros.) had a magnificent summer home. It really opened my eyes as to that most of us New Brunswickers do not appreciate the beauty that we have lying before us in our own backyard. Later on in August of 2010 my wife, Paula, and I launched our kayaks at the little dock that is adjacent to the ferry terminal to Grand Manan in Blacks Harbour. We paddled out to McCann Island (Hills Island), landed did a bit of hiking around the beautiful horseshoe shaped beaches and then we continued on to check out the other islands in Bliss Harbour and Back Bay. 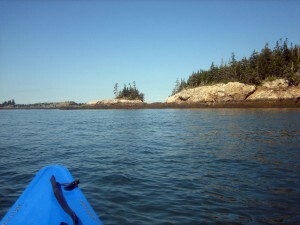 We went as far as the tip of Whitehead Island and then headed back in to Back Bay and paddled down through The Narrows, ultimately doing a complete circumnavigation of Frye Island and then had a strenuous paddle back to the ferry terminal. It was a long day on the water, but the islands and the area were absolutely beautiful. I may be interested in buying Bliss Island. Can you send me details and pitures of the island? Hi Jeffrey, please contact Brian directly at bricull[at]nbnet.nb.ca (make sure to replace [at] with an @ sign of course).